With many years experience making market leading compressed air dryers, our team of experienced engineers have applied their knowledge and experience into eliminating many of the problems associated with desiccant dryers. 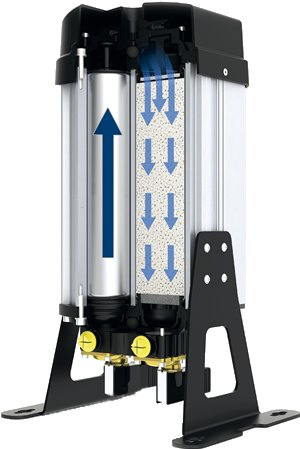 Our Hydra-D range is a new standard for compressed air dryers incorporating innovative features and benefits. Compressed air is an important source of energy that is widely used throughout industry. As a business, we aim to understand our customers’ challenges. We then connect our products, people and expertise in order to deliver exceptional service and solutions. These improve the performance of our customers’ machinery.We call this Engineering great, and we deliver it to customers through a world-class portfolio of high performance products, through close partnerships and problem-solving, and through a global network of support which ensures reliable local delivery, all over the world.Part of IMI plc, we have a sales and service network in 75 countries, as well as manufacturing capability in the USA, Germany, China, UK, Switzerland, Czech Republic, Mexico and Brazil. We support this with our global centres of technical excellence, and facilities for CFD design and R&D testing. We employ a dedicated team of field engineers, sector specialists and key account managers – all committed to providing excellent service to our customers.